Miss Thailand Universe Sopita Kanchanarin (left) and Miss Iceland Universe Katrín Lea Elenudóttir (right) pose with a young turtle at the Sea Turtle Conservation Center in Bang Saray. Contestants in the Miss Universe pageant took a whirlwind tour through the Pattaya area, including a visit to the center where they released 20 endangered turtles into the sea, before next week’s final round outside Bangkok. Contestants in the Miss Universe pageant took a whirlwind tour through the Pattaya area before next week’s final round outside Bangkok. Deputy Mayor Poramet Ngampichet welcomed the contestants from 49 countries with local businessmen and top city and tourism officials Dec. 6. The 67th Miss Universe pageant is being held in Thailand for the third time after plans to hold the contest in both China and the Philippines fell through. The finals will be broadcast around the world Dec. 17 from Impact Arena, Exhibition and Convention Center in Nonthaburi. 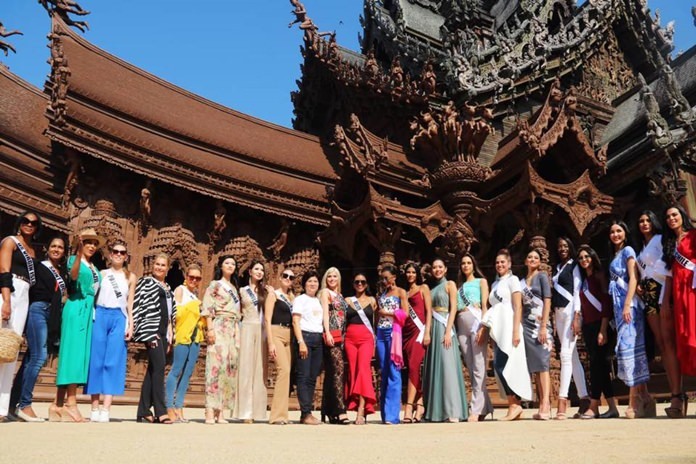 The beauty queens filmed a promotional video in Pattaya, visited the Sanctuary of Truth and had dinner at the Dusit Thani Hotel. They also took a boat trip to Koh Larn from Ocean Marina Yacht Club and did a photo shoot in Sattahip, the site of the “Best National Dress” competition on Dec. 10. From the Najomtien garden the Miss Universe hopefuls moved to Bang Saray and the Sea Turtle Conservation Center where Miss Thailand Universe Sopita Kanchanarin led them in releasing 20 endangered turtles into the sea. Miss Thailand Universe Sopita Kanchanarin and Miss Philippines Universe Catriona Gray lead contestants in the Miss Universe pageant on a tour of the Sea Turtle Conservation Center in Bang Saray. 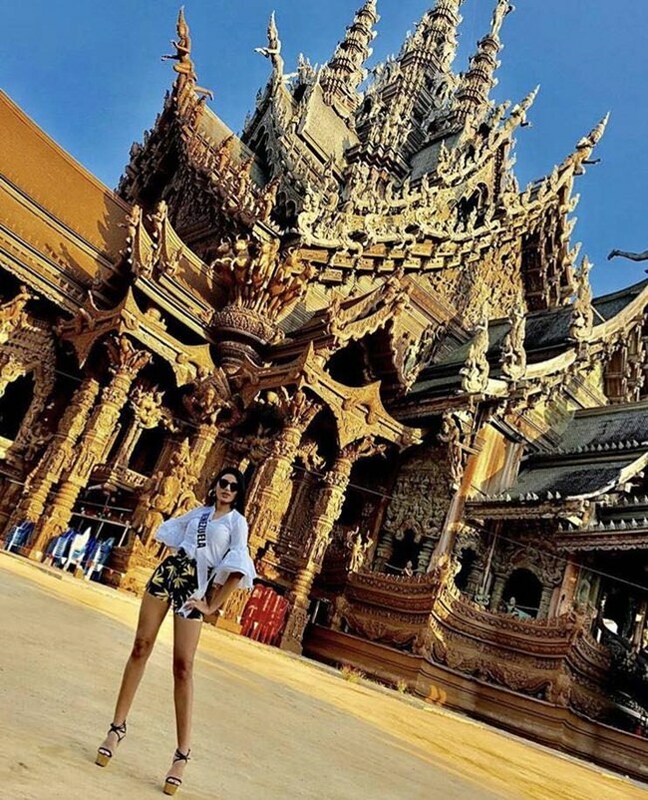 Miss Universe Venezuela Sthefany Gutiérrez poses in front of the Sanctuary of Truth in Naklua. Contestants gather for a group photo in front of the Sanctuary of Truth in Naklua. Contestants smile and wave after releasing turtles into the sea.